Have you ever noticed that a lot of the people looking forward to team building and company off-sites are the really outgoing employees? The extroverts are looking forward to the fun! As an executive coach in the San Francisco Bay Area, I coach a lot of highly analytical and technical leaders who are great at their jobs. And while not all of those highly analytical leaders are introverts, I’ve noticed that a high percentage of them fall into this category. Are they the ones looking forward to the team-building fun? Not so likely. In fact, it’s not hard to believe that many introverts look upon the requisite team-building exercises and company retreats as something to be endured. But don’t let that stop you from scheduling the next off-site for your company or team! It’s a special challenge (and interest) of mine to make sure that team-building exercises and leadership off-sites are enjoyable for everyone. That means extroverts, introverts, and everyone in between. Today I’m going to let you in a few of my favorite secrets for ensuring that your team-building activities are a success for the entire team. On the teams that I’ve worked with, I’ve noticed two primary divisions between introverts and extroverts. The first thing you’ll notice about these two divisions is that they translate into two groups of people who want opposite things. But don’t give up hope yet! It is possible to meet everyone’s process and energy needs and still have a great team bonding experience. The introverts prefer to process and synthesize new information on their own and then discuss their ideas with others. The extroverts prefer to process information by talking with others and literally thinking aloud to develop their ideas. This means that when there’s new information for your team to process, you want to find ways for everyone to do so. Commonly, that means building in some quiet reflection time and time for group discussion. The introverts get drained by spending too much time with others and need time alone to recharge. The extroverts can increase their energy and refuel through positive interactions with others. So go ahead and plan the super-social activities! Extroverts will enjoy them — and if you build in some quiet breaks (or “time on your own”) afterwards, the introverts might not mind them too much either. Two of my favorites for working with teams are the DiSC Leadership Assessment and the NBI Thinking Preference Assessment. There are two main reasons that I love bringing these types of assessments into the team building mix. First, assessments usually have reports. This means that there will be information written out for the introverts to read and process individually first. After that, you can create opportunities to process it as a group as well, which appeals to the extroverts. Second, the introverts and extroverts often end up in separate letters, colors, or parts of the assessment diagram. This means that the introverts and extroverts both get an opportunity to learn about their type within groups. Since the more outgoing people are usually grouped together, they can loudly bounce ideas and thoughts off one another. Meanwhile, the introverts grouped together tend to have a quieter, more mellow conversation and allow each other time to read the assessment and reflect on it individually before speaking about it together as a group. Going through the personality assessments can be a lot of fun. At some point in a company retreat, however, there often comes a time when the team or department really “gets down to work” and starts talking missions, strategies and even implementation logistics. What I frequently hear from more introverted clients is that these sessions can become tiring when the same people, who love to talk and think aloud, spend the whole session talking and thinking aloud — with little air time for those in the group who might take longer to respond. A graphic facilitator captures what people are saying in a creative way on whiteboards or large sheets of paper taped to the wall. You can have someone in your organization with facilitation training serve as the graphic facilitator or bring in a professional (I usually recommend the latter since it’s a pretty specialized skill). I’ve found that working with a graphic facilitator delivers three helpful team-building benefits. The process of seeing the conversations transferred — with style and flair — to the wall engages everyone in the room in a way that basic lists or note-taking can’t do. Once people see their words and ideas up on the wall, they can sit back and listen to what others have to say that’s different, instead of returning again and again to their idea to make sure it’s not forgotten (something that often happens in round-table discussions). Lastly, and perhaps most importantly, many people are visual, not audio learners. That means when they can see the meeting unfold on the wall in front of them, they can follow the conversation more closely and stay more engaged than during an audio-only group discussion. In an effort to fit in strategic planning, corporate reporting and updates, and team-building efforts into one retreat, each section often starts to get squished. That means the fun activities are often fast-paced, loud, all-out activities that have a maniacal feel as the teams compete against one another. Many of these exercises seem made for extroverts who have no problem loudly advocating for their ideas with others on the team. Meanwhile, many introverts sideline themselves to avoid adding to the cacophony of ideas. What can be much more powerful for both the introverts and extroverts in the group is a fun team-building activity that has time built in for planning, iteration, improvement and even role specialization. One very cool one I’ve found is the Marshmallow Challenge. It gives groups a fun challenge to work towards: building the highest tower of spaghetti and string with a marshmallow on top. The introverts have time, as the group iterates possible solutions, to get their voice into the mix — potentially with an important revelation that the fast-to-get-started hadn’t noticed. Meanwhile, the extroverts get to spend time with colleagues and enjoy the social aspects of collaborating together. Remember, the importance of this exercise, or any other team-building challenge, comes not just from the fun in the moment, but from the time you take as a group afterwards to talk about the different teaming and learning approaches: what worked best, when and why? If you’re organizing the event, make sure not to skimp on time to process together (and maybe sample a marshmallow or two!). As you plan your team-building exercises, retreats and offsites, keep in mind that in addition to thinking through the strategic goals of your day, it’s also crucial to consider the personalities of the people you’ll be bringing together. 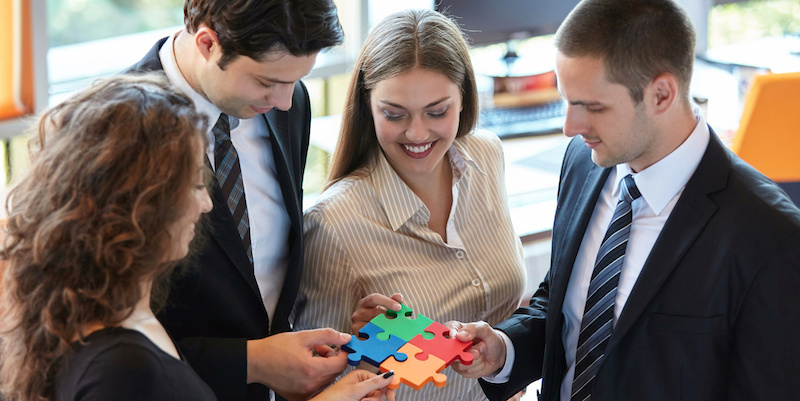 If you’re bringing awareness of personality styles to each element of the day, you can ensure that there are ample opportunities for all the players on your team to shine and feel included — and that’s a wonderful way to engage and connect your team. What about you? Whether you’re an introvert or an extrovert, what’s the best team-building activity you’ve ever done? Jo Ilfeld, PhD is an executive leadership coach who specializes in working with senior executives and high potential leaders who are great at their jobs but frustrated with the people around them. She helps her clients build competency as confident, effective leaders who can work productively with anyone. You can take her complimentary high-performance leadership assessment or contact her directly at info@successreboot.com.